French biathlete Martin Fourcade stormed off the medal podium at the biathlon world championships after Russian competitors Alexander Loginov and Anton Shipulin refused to shake his hand. The incident happened as Fourcade was standing on the podium where he and his teammates received their silver medals after finishing second to Germany in the mixed relay event at the 2017 International Biathlon Union (IBU) world championships in Hochfilzen, Austria. Then it was Russia’s turn to receive their bronze medals. 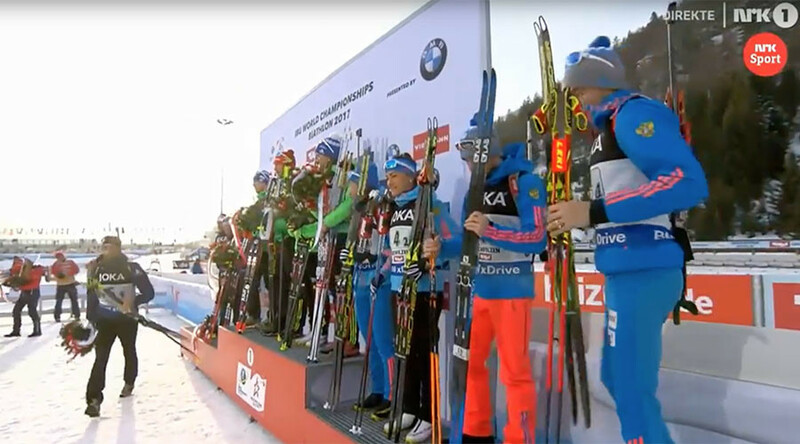 As the Russian team of Olga Podchufarova, Tatiana Akimova, Alexander Loginov and Anton Shipulin congratulated their German and then French counterparts, they stopped short of shaking hands with Fourcade, who was stood on the extreme left. Ten-time world champion and double Olympic champion Fourcade greeted the snub with sarcastic applause before jumping down from the podium. The Frenchman acknowledged the fans before trudging past the Russian team who had assembled on the far right of the podium. Fourcade was then persuaded to rejoin his team on the podium. Tensions had arisen between Russia and Fourcade during the race when Fourcade appeared to cause Loginov to fall during the race on Thursday. On completing his stage of the race, Loginov slowed down to rest but Fourcade pushed off on his skis, forcing Loginov to lose his balance. The Russian quartet deemed the trip deliberate and ignored Fourcade for what they saw as dire unsportsmanlike conduct. “Our team is a big family and if somebody behaves in a way which is not politically correct against a member of our team, this hurts me,” explained Shipulin, who was beaten in the sprint by Fourcade. However, Fourcade protested his innocence in a Facebook post where he denied his move had been intentional together with a slow-motion replay of the incident. “Do you really think it was intentional? I will never risk the disqualification of my teammates for any reason! Thanks for all your messages regarding this beautiful silver medal. The sport will go on,” the 29-year-old Frenchman wrote. He instead pointed to what he deemed hostility from the Russian side, claiming Russia requested a sanction against him after he tweeted against Loginov. Fourcade has also been a outspoken advocate for a crackdown on doping, a problem that is rife within the sport. Loginov was returning from a two-year ban from the sport for doping. On Wednesday, the IBU informed Russia it must relinquish the right to host the IBU 2021 World Championship, planned for the Tyumen region. Last month, 22 Russian biathletes who had been suspected of doping following the publication of the second part of the WADA Independent Commission report were cleared by the IBU of any suspicion.